35 fisheries Monitoring, Control and Surveillance (MCS) officers of 16 countries met in Barbados and reached an expert agreement on the introduction of harmonized standards for fishing vessel marking and identification, the establishment of a regional record of authorized fishing vessels and a regional list of vessels involved in Illegal, Unreported and Unregulated (IUU) fishing and related activities. The countries gathered in the 2nd meeting of the Regional Working Group on IUU Fishing (RWG-IUU); a joint working group, convened by the Caribbean Regional Fisheries Mechanism (CRFM) and composed of members of the Western Central Atlantic Fishery Commission (WECAFC), the CRFM and the Organization for Fisheries and Aquaculture of Central America (OSPESCA). The measures discussed and agreed by the experts at this meeting allow the fisheries inspectors, coast guard, navy and port officials to easily identify fishing vessels and see if the vessels have the necessary authorizations to fish. The measures will facilitate the work of the inspectors and other officials, who will have access to a regional record of authorized fishing vessels and lists of presumed and confirmed IUU fishing vessels. This will enable them to deny port access and support prosecution actions against IUU vessels. The advice from the Working Group will be reviewed by the Interim Coordination Mechanism for sustainable Fisheries of WECAFC, CRFM and OSPESCA and is likely to be endorsed in 2018 by all countries in the region for implementation to start in early 2019. At the meeting, the MCS officers were updated on the International Plan of Action to prevent, deter and eliminate IUU fishing (IPOA-IUU), the Global Record of Fishing Vessels, Refrigerated Transport Vessels and Supply Vessels, and specific measures needed in the Caribbean region to effectively end IUU fishing. IUU fishing is a hot topic in the region. Illegal fishing is not just fishing against the laws that are in place. It is also destroying the efforts of fisheries managers and legitimate fishers to manage and conserve the aquatic biodiversity and stocks. The growth in IUU fishing is driven by greed, opportunities provided and lack of deterrent. The joint Working Group aims to build capacity within the region to tackle IUU fishing and strengthen collaboration between the countries in the region in doing so. The Western Central Atlantic, which includes the Caribbean Sea, is in the top five most overexploited fisheries areas worldwide. Fisheries production decreased from 2.5 million tonnes annually in the 1980s to 1.3 million tonnes in recent years. It is estimated that IUU fishing in the Western Central Atlantic accounts for between 20 and 30% of total reported harvests, representing a value of 450 to 750 million USD annually with dire implications for millions of peoples’ livelihoods, especially in the Caribbean islands. FAO, WECAFC, CRFM and OSPESA encourage all Caribbean states to join in this regional effort to reduce IUU fishing and to adopt international best-practices to build a viable fisheries based on sustainable stocks. This meeting of the RWG-IUU was made possible with support from the European Union’s DG Mare and FAO’s Global Record team. 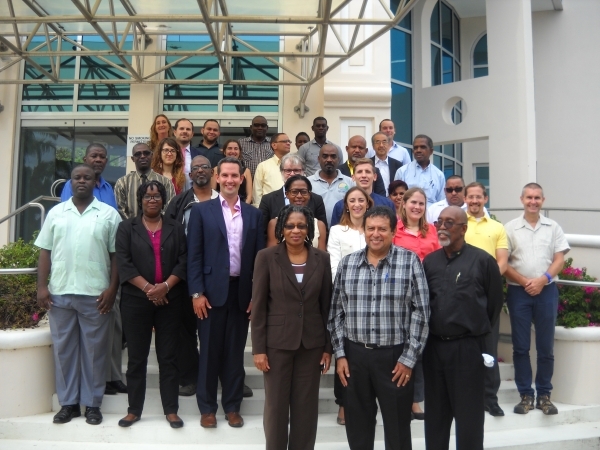 The 2nd meeting of the Regional Working Group on IUU fishing was held in Barbados on 19-21 September at the Secretariat of the WECAFC in the United Nations House in Barbados.